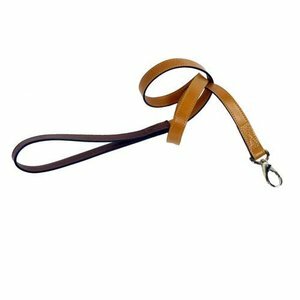 A timeless and elegant handmade tan dog leash from dual Italian leather with nickel fittings, available in various sizes. A beautiful handmade natural tan dog leash from 100% Italian leather. The handle is made of rich brown leather. This dog leash is equipped with a sturdy carabiner of polished nickel. This beautiful leash fits perfectly with the dog collars Hartman and forms a splendid set. Please note that this is a handmade product made exclusively per order. Please ensure that you order the right size, color and width.